Please enter your email if you would like to sign up for our once monthly email publication. By clicking submit you agree to pubicly display your submission and any information you posted on the internet, this website, and any related social media sites. Your post will be reviewed for approval. If approved, it will be posted within 48 hours. Thank you for joining he conversation about end-of-life care and supporting Hospice of Southern Illinois. fill the back of a truck with pillows and camp underneath the stars. Feel that daughter loves me as I am. See my grandson graduate from college, get married and have me a great grandbaby. Find peace and relaxation in every day! Watch my girls get married and have kids. Go to Germany and see where my ancestors are fro. get my passport and travel the world! Sing back up for a band!!! Hospice of Southern Illinois is joining the movement and conversation about the “Before I die…” wall. Candy Chang made the first wall in 2011 in New Orleans. We hope our participation bringing our portable walls to health fairs and community events will encourage people to start a healthcare conversation before it is needed; spread awareness that hospice is about how you live; and make it easier to talk about hard topics, like death. We debuted our first portable wall at an employee health fair. From this, we saw employees engaging with their peers and other healthcare professionals. They were sharing life stories, talking about future goals and dreams, and starting their healthcare conversation! This inspired our virtual “Before I die…” wall here on our website. Please take the time to fill out the form! We look forward to your post. Following your post, please learn more about your advance directive and starting the conversation about end-of-life decisions. Free resources can be found on the community page of our website, click here. 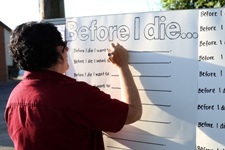 To have Hospice of Southern Illinois bring a portable “Before I die…” wall to your health fair or community event, please reach out to us 1-800-233-1708. We also provide speaking engagements on a variety of healthcare topics at no cost to you or your organization. Visit our website for more information, www.hospice.org. We are your resource for end-of-life care. There comes a time… to start the conversation.